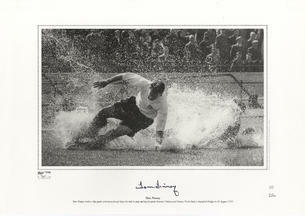 This is an In Person signed Black and White Print 16" x 12" from a Limited Edition run being number 111 of 250 of the iconic "Splash" image. Sir Thomas Finney, CBE (5 April 1922 - 14 February 2014), Preston, Lancashire) was an English footballer, famous for his loyalty to his league club, Preston North End, and for his performances in the English national side. Finney was also the President of Kendal Town. He was appointed an Officer of the Order of the British Empire (OBE) in the 1961 Queen's New Year Honours and a Commander of the Order of the British Empire (CBE) in the 1992 Queen's New Year Honours and was knighted in the 1998 Queen's New Year Honours.